Here’s an excerpt from The Disappeared, the first in my Retrieval Artist series. This is a USA Today bestselling series, and the very first novella in the series was nominated for a Hugo. You’ll find ordering information at the end of this post. Here’s the back cover copy, followed by the excerpt and the ordering information. 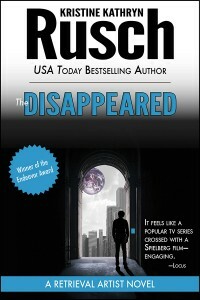 Io9says Miles Flint is one of “the top ten greatest science fiction detectives of all time.” The Disappeared is Flint’s very first adventure, the story that turns him from a police detective in the Armstrong Dome on the Moon into a Retrieval Artist. In a universe where humans and aliens have formed a loose government called the Earth Alliance, treaties guarantee that humans are subject to alien laws when on alien soil. But alien laws often make no sense, and the punishments vary from loss of life to loss of a first-born child. Now three cases have collided: a stolen spaceyacht filled with dead bodies, two kidnapped human children, and a human woman on the run, trying to Disappear to avoid alien prosecution. Flint must enforce the law—giving the children to aliens, solving the murders, and arresting the woman for trying to save her own life. But how is a man supposed to enforce laws that are unjust? How can he sacrifice innocents to a system he’s not sure he believes in? How can Miles Flint do the right thing in a universe where the right thing is very, very wrong? She had to leave everything behind. Ekaterina Maakestad stood in the bedroom of her Queen Anne home, the ancient Victorian houses of San Francisco’s oldest section visible through her vintage windows, and clutched her hands together. She had made the bed that morning as if nothing were wrong. The quilt, folded at the bottom, waiting for someone to pull it up for warmth, had been made by her great-great-grandmother, a woman she dimly remembered. The rocking chair in the corner had rocked generations of Maakestads. Her mother had called it the nursing chair because so many women had sat in it, nursing their babies. Ekaterina would never get the chance to do that. She had no idea what would happen to it, or to all the heirloom jewelry in the downstairs safe, or to the photographs, taken so long ago they were collectors items to most people but to her represented family, people she was connected to through blood, common features, and passionate dreams. She was the last of the Maakestad line. No siblings or cousins to take all of this. Her parents were long gone, and so were her grandparents. When she set up this house, after she had gotten back from Revnata, the human colony in Rev territory, she had planned to raise her own children here. Downstairs, a door opened and she froze, waiting for House to announce the presence of a guest. But House wouldn’t. She had shut off the security system, just as she had been instructed to do. She twisted the engagement ring on her left hand, the antique diamond winking in the artificial light. She was supposed to take the ring off, but she couldn’t bring herself to do so. She would wait until the very last minute, then hand the ring over. If she left it behind, everyone would know she had left voluntarily. “Kat?” Simon. He wasn’t supposed to be here. She swallowed hard, feeling a lump in her throat. “I know.” Her voice sounded normal. Amazing she could do that, given the way her heart pounded and her breath came in shallow gasps. She had to get him out of here and quickly. He couldn’t be here when they arrived, or he would lose everything too. The stairs creaked. He was coming up to see her. “I’ll be right down!” she called. She didn’t want him to come upstairs, didn’t want to see him here one last time. With her right hand, she smoothed her blond hair. Then she squared her shoulders and put on her courtroom face. She’d been distracted and busy in front of Simon before. He might think that was what was happening now. She left the bedroom and started down the stairs, making herself breathe evenly. For the last week, she hadn’t seen him—pleading work, then making up travel, and a difficult court case. She had been trying to avoid this moment all along. As she reached the first landing, the stairs curved, and she could see him, standing in the entry. Simon wasn’t a handsome man. He didn’t use enhancements—didn’t like them on himself or anyone. As a result, his hair was thinning on top, and he was pudgy despite the exercise he got. But his face had laugh lines. Instead of cosmetic good looks, Simon had an appealing rumpled quality, like an old favorite old shirt or a quilt that had rested on the edge of the bed for more than a hundred years. He was holding flowers, a large bouquet of purple lilacs, their scent rising up to greet her. He had House’s security combination, just like she had his. They had exchanged the codes three months ago, the same night they got engaged. She could still remember the feelings she had that night. The hope, the possibility. The sense that she actually had a future. He waited for her to get to the bottom of the stairs, then he handed her the bouquet. Beneath the greenery, her hands found a cool vase, a bubble chip embedded in the glass keeping the water’s temperature constant. She buried her face in the flowers, glad for the momentary camouflage. She had no idea when she would see flowers again. “Thank you,” she said, her voice trembling. She turned away, made herself put the flowers on the table she kept beneath the gilt-edged mirror in her entry. She wanted to lean against him, to tell him the truth, to let him share all of this—the fears, the uncertainty. But she didn’t dare. He couldn’t know anything. “I’m tired,” she said, and she wasn’t lying. She hadn’t slept in the past eight days. She could see his familiar face in the mirror beside her strained one. Even when she tried to look normal, she couldn’t. The bags beneath her eyes hadn’t been there a month ago. Neither had the worry lines beside her mouth. He watched her watch herself, and she could tell from the set of his jaw, the slight crease on his forehead, that he was seeing more than he should have been. “This case is tearing you apart,” he said softly. She nodded and turned in his arms, trying to memorize the feel of him, the comfort he gave her, comfort that would soon be gone. “I have to meet a client,” she said. He caressed her cheek with the back of his hand, then kissed her. She lingered a moment too long, caught between the urge to cling and the necessity of pushing him away. “I love you,” she said as she ended the kiss. “Sounds good,” she said, making no promises. She couldn’t bear to make another false promise. He still didn’t move away. She resisted the urge to look at the two-hundred-year-old clock that sat on the living room mantel. He stepped back from her and she realized she sounded abrupt. But he had to leave. She had to get him out and quickly. “They were supposed to brighten the day,” he said, raising his hands toward the grayness. “They have.” She watched as he walked down the sidewalk toward his aircar, hovering the regulation half foot above the pavement. No flying vehicles were allowed in Nob Hill because they would destroy the view, the impression that the past was here, so close that it would take very little effort to touch it. She closed the door before he got into his car, so that she wouldn’t have to watch him drive away. Her hand lingered over the security system. One command, and it would be on again. She would be safe within her own home. The scent of the lilacs overpowered her. She stepped away from the door and stopped in front of the mirror again. Just her reflected there now. Her and a bouquet of flowers she wouldn’t get to enjoy, a bouquet she would never forget. She twisted her engagement ring. It had always been loose. Even though she meant to have it fitted, she never did. Perhaps she had known, deep down, that this day would come. Perhaps she’d felt, ever since she’d come to Earth, that she’d been living on borrowed time. The ring slipped off easily. She stared at it for a moment, at the promises it held, promises it would never keep, and then she dropped it into the vase. Someone would find it. Not right away, but soon enough that it wouldn’t get lost. Maybe Simon would be able to sell it, get his money back. Or maybe he would keep it as a tangible memory of what had been, the way she kept her family heirlooms. Something scuffled outside the door—the sound of a foot against the stone stoop, a familiar sound, one she would never hear again. Her heart leaped, hoping it was Simon, even though she knew it wasn’t. As the brass doorknob turned, she reached into the bouquet and pulled some petals off the nearest lilac plume. She shoved them in her pocket, hoping they would dry the way petals did when pressed into a book. Then the door opened and a man she had never seen before stepped inside. He was over six feet tall, broad-shouldered and muscular. His skin was a chocolate brown, his eyes slightly flat, the way eyes got when they’d been enhanced too many times. “Yes,” she said, hoping it was true. The man studied her, as if he could tell if she were lying just by staring at her. Then he touched the back of his hand. Until that moment, she hadn’t seen the chips dotting his skin like freckles—they matched so perfectly. “Back door,” he said, and she knew he was using his link to speak to someone outside. He took her hand. His fingers were rough, callused. Simon’s hands had no calluses at all. “Is everything in its place?” the man asked. “Good.” He tugged her through her own kitchen, past the fresh groceries she had purchased just that morning, past the half-empty coffee cup she’d left on the table. The back door was open. She shook her hand free and stepped out. The fog was thicker than it had been when Simon left, and colder too. She couldn’t see the vehicle waiting in the alley. She couldn’t even see the alley. She was taking her first steps on a journey that would make her one of the Disappeared, and she could not see where she was going. How appropriate. Because she had no idea how or where she was going to end up. Jamal sampled the spaghetti sauce. The reconstituted beef gave it a chemical taste. He added some crushed red pepper, then tried another spoonful, and sighed. The beef was still the dominant flavor. He set the spoon on the spoon rest and wiped his hands on a towel. The tiny kitchen smelled of garlic and tomato sauce. He’d set the table with the china Dylani had brought from Earth and their two precious wine glasses. Not that they had anything to celebrate tonight. They hadn’t had anything to celebrate for a long time. No real highs, no real lows. Jamal liked it that way—the consistency of everyday routine. Sometimes he broke the routine by setting the table with wineglasses, and sometimes he let the routine govern them. He didn’t want any more change. There had been enough change in his life. Dylani came out of their bedroom, her bare feet leaving tiny prints on the baked mud floor. The house was Moon adobe, made from Moon dust plastered over a permaplastic frame. Cheap, but all they could afford. Dylani’s hair was pulled away from her narrow face, her pale gray eyes red-rimmed, like they always were when she got off of work. Her fingertips were stained black from her work on the dome. No matter how much she scrubbed, they no longer came clean. “He’s sleeping,” she said, and she sounded disappointed. Their son, Ennis, was usually asleep when she got home from work. Jamal planned it that way—he liked a bit of time alone with his wife. Besides, she needed time to decompress before she settled into her evening ritual. She was one of the dome engineers. Although the position sounded important, it wasn’t. She was still entry level, coping with clogs in the filtration systems and damage outsiders did near the high-speed train station. If she wanted to advance, she would have to wait years. Engineers didn’t retire in Gagarin Dome, nor did they move to other Moon colonies. In other colonies, the domes were treated like streets or government buildings—something to be maintained, not something to be enhanced. But Gagarin’s governing board believed the dome was a priority, so engineers were always working on the cutting edge of dome technology, rather than rebuilding an outdated system. “How was he?” Dylani walked to the stove and sniffed the sauce. Spaghetti was one of her favorite meals. One day, Jamal would cook it for her properly, with fresh ingredients. One day, when they could afford it. “The usual,” Jamal said, placing the bread he’d bought in the center of the table. The glasses would hold bottled water, but it was dear enough to be wine—they would enjoy the water no less. Ever since they found out Dylani was pregnant, Ennis had become the center of their world—and the heart of Jamal’s nightmares. He was smothering the boy and he knew it. Ennis was ten months now—the age when a child learned to speak and walk—and he was beginning to understand that he was a person in his own right. Jamal had read the parenting literature. He knew he should encourage the boy’s individuality. But he didn’t want to. He wanted Ennis beside him always, in his sight, in his care. Dylani understood Jamal’s attitude, but sometimes he could feel her disapproval. She had been tolerant of his paranoia—amazingly tolerant considering she had no idea as to the root cause of it. She thought his paranoia stemmed from first-child jitters, instead of a real worry for Ennis’s safety. Jamal wasn’t sure what he would do when Ennis had to go to school. In Gagarin, home schooling was not an option. Children had to learn to interact with others—the governing board had made that law almost a hundred years ago, and despite all the challenges to it, the law still stood. Someday Jamal would have to trust his boy to others—and he wasn’t sure he could do it. Mr. Biscuit was Ennis’s stuffed dog. Dylani’s parents had sent the dog as a present from Earth. They also sent some children’s vids—flats because Dylani believed Ennis was too young to understand the difference between holographic performers and real people. Ennis’s favorite vid was about a little boy who learned how to fly. “How’s Mr. Biscuit taking this?” Dylani asked. The boiling pot beeped. The noodles were done. Jamal put the pot in the sink, pressed the drain button, and the water poured out of the pot’s bottom into the recycler. But Jamal stopped listening. Another shiver ran down his back. It wasn’t Dylani’s news that was making him uneasy. The kitchen was actually cold and it shouldn’t have been. Cooking in such a small space usually made the temperature rise, not lower. He went to the kitchen door. Closed and latched. But she didn’t. Her lips became a thin line. He recognized the look. She hated it when he did this, thought his paranoia was reaching new heights. Maybe it was. He always felt stupid after moments like this, when he realized that Ennis was safe in his bed and nothing was wrong. But that didn’t stop him from prowling through the house, searching for the source of the chill. He’d never forgive himself if something happened and he didn’t check. He could hear the annoyance in Dylani’s voice, but he ignored it, walking past her into the narrow hallway between the kitchen and the living room. He turned right, toward their bedroom. It was dark like Dylani had left it, but there was a light at the very end of the hall. In Ennis’s room. Jamal never left a light on in Ennis’s room. The boy napped in the dark. Studies had shown that children who slept with lights on became nearsighted, and Jamal wanted his son to have perfect vision. He was running down the hallway now. He couldn’t have slowed down if he tried. Dylani might have left the light on, but he doubted it. She and Jamal had discussed the nightlight issue just like they had discussed most things concerning Ennis. They never left his window open—that was Dylani’s choice. She knew how contaminated the air had become inside the dome, and she felt their environmental filter was better than the government’s. No open window, no cooler temperatures. He slid into Ennis’s room, the pounding of his feet loud enough to wake the baby. Dylani was running after him. The room looked normal, bathed in the quiet light of the lamp he had placed above the changing table. The crib nestled against one corner, the playpen against another. The changing table under the always closed window—which was closed, even now. But the air was cooler, just like the air outside the house was cooler. Since Ennis was born, they’d spent extra money on heat just to make sure the baby was comfortable. Protected. Safe. Jamal stopped in front of the crib. He didn’t have to look. He could already feel the difference in the room. Someone else had been here, and not long ago. Someone else had been here, and Ennis was not here, not any longer. Still, he peered down at the mattress where he had placed his son not an hour ago. Ennis’s favorite blanket was thrown back, revealing the imprint of his small body. The scents of baby powder and baby sweat mingled into something familiar, something lost. Mr. Biscuit perched against the crib’s corner, his thread eyes empty. The fur on his paw was matted and wet where Ennis had sucked on it, probably as he had fallen asleep. The pacifier that he had yet to grow out of was on the floor, covered in dirt. “Jamal?” Dylani’s voice was soft. Jamal couldn’t turn to her. He couldn’t face her. All he could see was the gold bracelet that rested on Ennis’s blanket. The bracelet Jamal hadn’t seen for a decade. The symbol of his so-called brilliance, a reward for a job well done. He had been so proud of it when he received it, that first night on Korsve. And so happy to leave it behind two years later. “I don’t know.” Jamal’s voice shook. He was lying. He tried not to lie to Dylani. Did she know that his voice shook when he lied? As she came into the room, he snatched the bracelet and hid it in his fist. Jamal slipped the bracelet into his pocket, then put his arms around his wife. “We need help,” she said. “I know.” But he already knew it was hopeless. There was nothing anyone could do. The holovid played at one-tenth normal size in the corner of the space yacht. The actors paced, the sixteenth-century palace looking out of place against the green-and-blue plush chairs beside it. Much as Sara loved this scene—Hamlet’s speech to the players—she couldn’t concentrate on it. She regretted ordering up Shakespeare. It felt like part of the life she was leaving behind. Sara wondered if the other two felt as unsettled as she did. But she didn’t ask. She didn’t really want the answers. The others were in this because of her, and they rarely complained about it. Of course, they didn’t have a lot of choice. She glanced at them. Ruth had flattened her seat into a cot. She was asleep on her back, hands folded on her stomach like a corpse, her curly black hair covering the pillow like a shroud. Isaac stared at the holovid, but Sara could tell he wasn’t really watching it. He bent at his midsection, elbows resting on his thighs, his care-lined features impassive. He’d been like this since they left New Orleans, focused, concentrated, frozen. Sara stopped the holovid. Space yachts didn’t bounce. There was nothing for them to bounce on. “What the hell was that?” she asked. Neither Ruth nor Isaac answered. Ruth was still asleep. Isaac hadn’t moved. She got up and pulled up the shade on the nearest portal. Earth mocked her, blue and green viewed through a haze of white. As she stared at her former home, a small oval-shaped ship floated past, so close it nearly brushed against the yacht. Through a tiny portal on the ship’s side, she caught a glimpse of a human face. A white circle was stamped beneath the portal. She had seen that symbol before: it was etched lightly on the wall inside the luxurious bathroom off the main cabin. No one answered her. When she took her finger off the intercom, she didn’t even hear static. She shoved Isaac’s shoulder. He glared at her. “I think we’re in trouble,” she said. She got up and walked through the narrow corridor toward the pilot’s quarters and cockpit. The door separating the main area from the crew quarters was large and thick, with a sign that flashed No Entry without Authorization. This time, she hit the emergency button, which should have brought one of the crew into the back. But the intercom didn’t come on and no one moved. She tried the door, but it was sealed on the other side. The yacht rocked and dipped. Sara slid toward the wall, slammed into it, and sank to the floor. Seatbelt lights went on all over the cabin. Ruth had fallen as well. She sat on the floor, rubbing her eyes. Isaac was the only one who stayed in his seat. “What’s going on?” Ruth asked. “That’s what I’d like to know,” Sara said. She grabbed one of the metal rungs, placed there for zero-g flight, and tried the door again. It didn’t open. The yacht shook, and Sara smelled something sharp, almost like smoke, but more peppery. He grabbed the rungs and walked toward her, his feet slipping on the tilted floor. Ruth pulled herself into her chair, her face pale, eyes huge. Sara had only seen her look like that once before—when they’d seen Ilanas’s body in the newsvids, sprawled across the floor of their rented apartment in the French Quarter. The door clicked and Isaac pushed it open. Sweat ran down Sara’s back, even though the yacht hadn’t changed temperature. The smell had grown worse, and there was a pounding coming from the emergency exit just inside the door. Isaac bit his lower lip. “Hello?” Sara called. Her voice didn’t echo, but she could feel the emptiness around her. There was no one in the galley, and the security guard who was supposed to be sitting near the cockpit wasn’t there. Isaac stayed by the emergency exit. He was studying that control panel. Ruth had crawled across her cot, and was staring out the panel on her side of the ship. Her hands were shaking. Sara turned her back on them. She went inside the cockpit—and froze. It was empty. Red lights blinked on the control panels. The ship was on autopilot, and both of its escape pods had been launched. A red line had formed on a diagram of the ship, the line covering the emergency exit where the noise had come from. More red illuminated the back of the ship. She punched vocal controls. They had been shut off—which explained why silence had greeted her when she tried the intercom, when she hit the emergency switch, even when she had touched the sealed door. Warning, the ship’s computer said. Engines disabled. Breach in airlock one. Intruder alert. Sara sat in the pilot’s chair. It had been years since she’d tried to fly a ship and she’d never operated anything this sophisticated. She had to focus. First she had to bring the controls back online. Most of them had been shut off from the inside. She didn’t want to think about what that meant. Not now. She needed visuals. She opened the ports around her, and then wished she hadn’t. A large white ship hovered just outside her view, its pitted hull and cone-shaped configuration sending a chill through her heart. The Disty had found her—and they were about to break in.